Foot problems are one of the most common conditions I see in my practice. And amongst them, over-pronation is usually the “cause” of most foot complaints. What’s the cause of that, right? We’ll get there. Over-pronation refers to when the “foot rolls in excessively” (some degree of pronation is normal) or the feet go “flat” when walking; during the “foot-flat” phase of gait. This person will usually have “flat-feet” in a standing posture as well. This can lead to bunions, plantar fasciitis, shin splints, achilles tendonitis, muscle spasms in the foot, and still more foot conditions. Also, in can lead to medial (inside) knee pain, hip pain, low back pain, neck pain, and even TMJ pain and dysfunction. These compensations can then lead to even more conditions. For example: meniscus problems/tears in the knee, greater trochanteric bursitis (inflammation of a bursa near the hip), lumbar and cervical disc herniations, etc…. I really can go on and on. As everyone seems to understand, everything truly is “connected”. As a result one area of dysfunction can (and often does) lead to problems in other areas. The feet often lead to the most compensations because they are the “foundation” of the body. Think of it as if you were living in a house with a big “crack in the foundation”? Let’s now discuss over-pronation and my structural approach to treating people with this condition. These two muscles can dysfunction in several different ways in my experience. First, they can be outright inhibited usually due to joint dysfunction in the foot, lower (lumbar) spine, sacrum, and/or ilium; or direct trauma/injury to the muscle(s). Second, they can become inhibited after use (stretch or contraction) if they have trigger points (or “knots”) in them. Normally, a muscle should contract stronger (and facilitate) just after a stretch or contraction, but this usually won’t be the case when there are trigger points present. Please also note that attempting to do muscle rehabilitation in the form of strengthening and/or stretching can actually exacerbate the problem, if the complications just mentioned aren’t resolved first. My treatment approach is generally to “fix” the muscles and joints involved. Sometimes treatment directed to the ligaments, tendons, fascia, and/or skin are also necessary. And adjustments directed at restoring normal foot, lumbar spine, and pelvic joint range of motion are a must. Once the structures are restored to functioning optimally, I’ll have the patient do home exercises to get the most benefit out of the treatment; in order to increase the chances of resolving the problem quickly and permanently. Some patients may require orthotics (these are NOT strange Frankenstein-looking orthopedic shoes) that slip right into their shoe/sneaker. 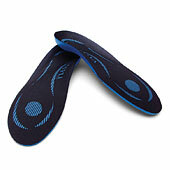 They are designed to maintain the shape of the arch (albeit passively), and most patients find them quite comfortable. These may be used permanently or temporarily depending on the severity of the problem and the age of the patient. I prefer not to use “crutches” but sometimes they can make all the difference. Also, taping the feet for about two weeks can be crucial as well. Structural problems elsewhere in the body can also contribute (or cause) over-pronation of the foot; and should also be ruled out. This can range from knee, hip, pelvis, low back, neck, and TMJ conditions. Additionally, nutritional issues can be a causative or exacerbating factor in allowing for these muscle to dysfunction. This usually has to do with insufficient nutrient supplies that help form and/or maintain the integrity of the structures involved; or be related to dysfunction in the organs or glands that relate to those muscles. There can certainly be other foot and ankle muscles involved, but I see the two mentioned as primary. By the way, as mentioned above, don’t be surprised if this is resulting in your neck and jaw pain. And, from what I gather through assessing and treating patients (along with knowledge of biomechanics) – this is the primary condition leading to a future hip replacement! Don’t hesitate to get this problem taken care of. Oh right – and people’s feet don’t grow when they get older. If you need to buy larger shoes later in life, you can almost be certain that you’re over-pronating and that your arches have “dropped”. Previous Post: « Don’t (always) take your supplements! So glad to read this! I am a TFH kinesiologist and have been trying to persuade my flat footed teen son to wear some orthotics and to let me work on his muscles & posture….your article here backs up exactly what I’ve said – Hurrah!